One bright and cold morning, Roz found the strange and mysterious object that was to change her life. She discovered the most wonderful wish-granting, mind-reading, time-travel device that you could ever imagine. One bright and cold morning, Roz found the strange and mysterious object that was to change her life. She discovered the most wonderful wish-granting, mind-reading, time-travel device that you could ever imagine. This device leads Roz and her friends into adventures, danger and excitement. 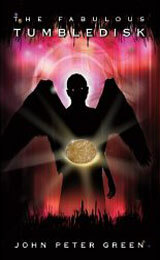 Apprentice guardian angels, mysterious treasure, special powers are all in store. Get on board now for a flight of imagination and fantasy in this hugely entertaining trilogy of adventures; the first book in the series. John Green retired to Devon to write and to be with three of his grandchildren and his daughter Annette and her husband Richard in their delightful Ilfracombe guest house. He now lives nearby them with his wife Christine. Having three grown-up daughters and eight grandchildren, he knows just how to spin a tale that will keep young readers spellbound. Be the first to review “The Fabulous Tumble Disk – John Green” Click here to cancel reply.